This is a chart I've been meaning to put together for some time. I spent some time researching out all the advertising specs and sizes and finally put it into a chart that shows relative Mega Pixels (MP) to common media sizes. Part of the reason why I put this together is an informational and educational tool to teach my students of relative sizes to the medias that they would need to publish in. The other part is to settle various arguments and debates when people throw numbers and sizes out there. Relying on my 25+ years in the printing industry, I also verified all the information from the various publication's specification sheets. One thing to note is that this does not take into account of typical cropping that happens in many studios and agencies. Average agency will typically crop out 20-30% of an image with a maximum usually of 40%. Some conclusions even enlightened me after I did all the math and verified everything. First, the 5Dmk2 as I recalled, does cover a double page Vogue magazine at 100% at their maximum specifications. However cropping is often necessary which means you'll need to generally go larger. 40MP Pentax 645D, Mamiya or Phase One is a more ideal size if a double page spread is needed especially if there's going to be cropping involved. Secondly, a Nikon D700 is more than capable for a full page Vogue Magazine ad as well. Even allows for a minor amount of cropping. It isn't however ideal for double page spread. Third and I hear this so often, reproduction for billboard. I know that for a fact publishing billboards myself that the resolution needed is far lower in specifications than what people presume it to be. 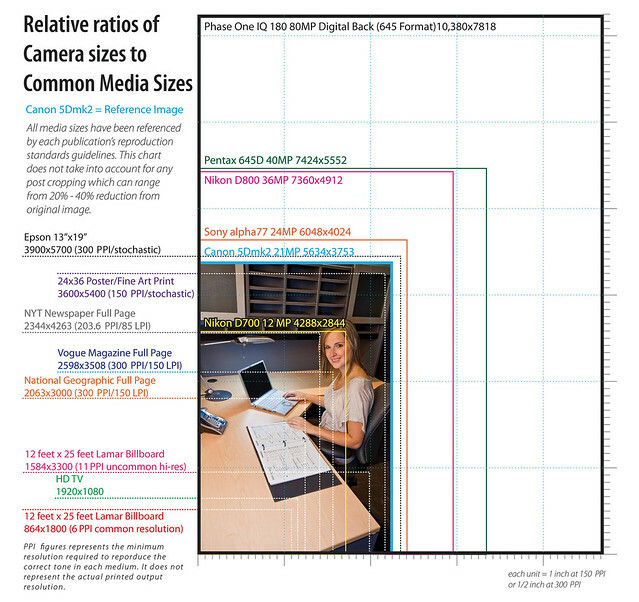 In the chart it is actually smaller than HD TV and even with double resolution specifications (which is very rare to produce because it really has no appreciable improvement on image quality from it's viewing distance) it's still well within most 12MP camera ranges. Fourth, a little bit of a surprise to me, is that the D700 or any 12MP camera is just capable of doing a double page spread in the National Geographic (technically just shy, but enough to fudge). A magazine that rarely crops images, and surprisingly only 150 LPI, needs only 300 DPI to reproduces their stunning images. Now the real question is where is the future of print media going. Online requirements are certainly far lower than these requirements, and eventually the domain of even the 20+ MP camera's days are numbered. Cropping aside, higher and higher MP cameras just don't make a lot of sense considering how much overhead is being wasted. Photographers are also trained not to shoot pictures for cropping, however sometimes art directors make decisions beyond photographers control, even 10% or 20% crops the cropped images still fit within most specifications. Terrance: very good work putting all this together. I've often tried to convince people that a billboard is smaller than a magazine's page -- to your eye. It's amazing how often I get a dumb look at first and then a slow nodding as they realize... You see a magazine page from 18 inches away, while you see a highway billboard from 50 yards away (minimum).